This document contains the final version of the revision of ASOP No. 3, now titled Continuing Care Retirement Communities. In 1987, the Interim Actuarial Standards Board adopted a document titled Relating to Continuing Care Retirement Communities (CCRCs). In 1990, the ASB revised and reformatted ASOP No. 3, Relating to Continuing Care Retirement Communities. In 1994, the ASB adopted another revision titled Practices Relating to Continuing Care Retirement Communities. In light of the evolution in practice since then, as well as the adoption of a new format for standards, the ASB believed it was appropriate to revise this standard in order to reflect current, generally accepted actuarial practice. Although parts of the existing ASOP that were considered educational in nature were moved to the appendix, some educational material was retained in the body of the proposed revision to reflect the paucity of literature concerning actuarial practice regarding CCRCs. This revision includes some prescriptive disclosure requirements that the task force believes are appropriate and are intended to enhance the quality of actuarial communications regarding CCRCs. The exposure draft of this revision was issued in December 2006 with a comment deadline of April 30, 2007. The Task Force to Revise ASOP No. 3 carefully considered the eight comment letters received and made changes to the language in several sections in response. For a summary of the substantive issues contained in the exposure draft comment letters and the responses, please see Appendix 2. There were no significant changes from the exposure draft although several clarifications were made. The ASB voted in September 2007 to adopt this standard. This actuarial standard of practice (ASOP) provides guidance to the actuary when performing professional services related to a continuing care retirement community (CCRC). This standard applies to actuaries when performing professional services, including giving advice, in connection with CCRCs (including nonprofit and for-profit entities). These professional services may be performed for owners, operators, financing entities, current residents, or prospective residents of a CCRC, as well as for other professionals or regulatory bodies. j. providing appropriate rates of mortality, morbidity, or life expectancies for the CCRC’s use. This standard is effective for professional services performed in connection with a CCRC on or after March 1, 2008. An amount that may be payable by a resident, in accordance with a residency agreement, for services made available but not covered by the advance fee and the periodic fees (such as guest meals, additional meals, barber/beauty shop, use of a carport, and non-covered health care services). A measure of the assets and liabilities, as of the valuation date, associated with current residents. An amount payable by a resident at the inception of a residency agreement. The advance fee is usually specified in the residency agreement and is usually payable prior to the resident assuming occupancy of a living unit (sometimes referred to as an entrance fee, endowment fee, entry fee, or founder’s fee). The value of cash, cash equivalents, and marketable securities of a CCRC (historically referred to as cash balance by CCRC practitioners). This excludes the value of the physical property assets of the CCRC. A hypothetical group of new residents assumed to enter the CCRC over a specified period of time and assumed to have certain demographic characteristics. A residential facility that provides stated housekeeping, social, and health care services in return for some combination of an advance fee, periodic fees, and additional fees. A combination of fees that generally includes advance fees, periodic fees, and additional fees. A clause in a residency agreement guaranteeing access to health care and defining the type of health care services to be provided to the resident. These health care services may be offered with or without additional charges to the periodic fees. A facility associated with a CCRC where health care is provided to residents in accordance with the residency agreement. The health center typically includes some combination of assisted living, special care, and nursing care units. Non-residents may also live in the health center. Living quarters designed for residents capable of living independently. A resident could receive home health care in the independent living unit, but a resident who needs full-time health care on either a temporary or permanent basis is normally transferred to the health center. Varying degrees of care, which are based on a resident’s health status. Typical levels of care include independent living units, assisted living units, nursing care units, and special care units. The levels of care may be dictated by state licensure. A transfer to a different level of care need not involve a transfer to a different type of living unit. The various living quarters of a CCRC, including independent living units and health center units. The probability of incurring an illness or disability requiring the transfer to a different level of care. The permanent transfer rates and the temporary transfer rates together comprise the morbidity rates. A person living in the CCRC who has signed an agreement without a health care guarantee and without a refund guarantee. Non-residents normally pay for all health care services received on a fee for service basis. Amounts payable by a resident periodically (usually monthly) during the existence of a residency agreement. The periodic fees are typically adjusted from time to time to reflect changes in operating costs. A move from one level of care to another level of care without expectation of returning to the former level of care. Physical assets, such as land, building, furniture, fixtures, or equipment, which belong to the CCRC. These assets, excluding land, are assumed to depreciate over their respective lifetimes. These assets are also referred to as the fixed assets of the CCRC. An estimate of the number of residents expected to live in the CCRC at various future times. The contract between one or more individuals and the CCRC that describes the services to be provided and the obligations of the parties. The contracts are usually of long duration and may be for the life of the individual or the life of the survivor of two or more individuals. The residency agreement describes the health care guarantee, if any, and any portion of the advance fee that would be refundable upon termination of the residency agreement. A person living in the CCRC who has signed a residency agreement with a health care guarantee or a refund guarantee. A move from one level of care to another level of care with the expectation of returning to the former level of care. Measure of rates of change, over time, that affects revenues, costs, or actuarial assumptions. The probability that a residency agreement will be terminated by the resident’s leaving the CCRC for reasons other than death. The date as of which the values of the assets and liabilities of the CCRC are determined. When providing professional services related to a CCRC, the actuary should consider the relevant financial items associated with the CCRC, current residents, new residents, and levels of care provided, as well as relevant residency agreement provisions and applicable law. The actuary should use methods and assumptions that are, in the actuary’s professional judgment, appropriate in light of the scope and purpose of the assignment. The resources available to the CCRC related to current residents include any existing resources for the current residents plus the actuarial present value of future resources, such as periodic fees expected to be paid in the future by such residents. The actuary may consider these resources adequate if they are greater than or equal to any existing liabilities for the current residents plus the actuarial present value of the expected costs associated with the obligations to such residents under their contracts. The actuary should determine if this condition is satisfied through the use of the actuarial balance sheet (see Section 3.4). A proposed CCRC is not required to meet this condition to be in satisfactory actuarial balance. The actuary should start evaluating this condition for a new CCRC when the block of current residents is of sufficient size to make this determination. For example, the actuary may evaluate this condition at the earlier of three years after opening or when the CCRC reaches its targeted occupancy. For a cohort of new residents, the expected fees are the sum of the advance fee paid at or before occupancy plus the actuarial present value at occupancy of the new residents’ expected future periodic fees. Expected fees may include any future additional fees and third party payments attributable to the new residents. The actuary may consider the fee structure adequate if the expected fees are greater than or equal to the actuarial present value at occupancy of the costs associated with the obligations assumed by the CCRC for that cohort. The actuary should determine if this condition is satisfied through the use of the cohort pricing analysis (see Section 3.5). The actuary should project cash and investment balances over the projection period. This projection should include revenue and expenses from all known sources, including current and new residents and non-residents. The actuary should choose a projection period that extends to a point at which, in the actuary’s professional judgment, the use of a longer period would not materially affect the results and conclusions. The actuary may consider the cash and investment balances adequate if these balances are positive in each projection year. The actuary should determine if this condition is satisfied through the use of the cash flow projection (see Section 3.7). The actuary should base the development of the actuarial balance sheet (see Section 3.4), the cohort pricing analysis (see Section 3.5), and the cash flow projection (see Section 3.7) respectively on the three types of population projections described below, using appropriate assumptions for mortality, morbidity, and withdrawal. The actuary should project the residents’ movements through various levels of care, the number of surviving residents by level of care status, and the projected number of independent living units occupied. When testing for condition 1 (see Sections 3.2.1 and 3.4), the actuary should use a population projection that is performed solely with respect to current residents on the valuation date. The actuary should project the surviving residents’ movements through various levels of care until contract termination by death or withdrawal. This projection excludes new residents and non-residents. Group Projection of a Cohort of New Residents—When testing for condition 2 (see Sections 3.2.2 and 3.5), the actuary should use a population projection that is performed solely with respect to a cohort of new residents. The actuary should project the surviving residents’ movements through various levels of care until contract termination by death or withdrawal. This projection excludes non-residents. 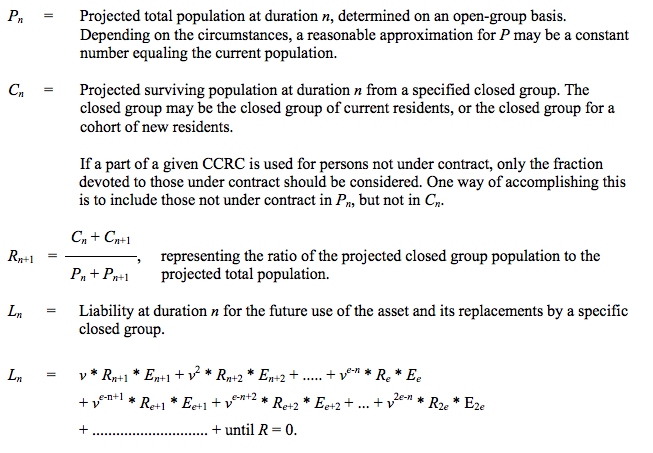 When testing for condition 3 (see Sections 3.2.3 and 3.7), the actuary should use a population projection that tracks residents in the CCRC on the valuation date together with expected new residents consistent with assumed occupancy levels. The actuary should reflect non-residents in this population projection if they will fill unoccupied units or beds in various levels of care consistent with assumed occupancy levels. The actuary should consider the guidance below when developing the actuarial balance sheet. 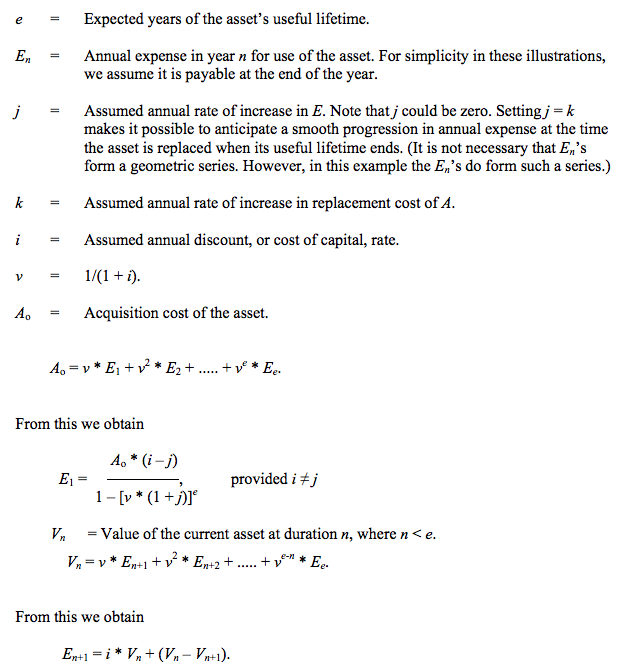 The actuary should estimate the following: the actuarial present value of future periodic fees (described in Section 3.6.1), the actuarial present value of future additional fees and third party payments (described in Section 3.6.2), and the actuarial value of physical property for assets currently in service (described in Section 3.6.3). The actuary should reflect in the actuarial balance sheet other assets from the accounting balance sheet as appropriate, in the actuary’s professional judgment. These assets generally include such items as cash and investment balances, current receivables, and other items not specifically reflected in the above guidance. The actuary should estimate the following: the actuarial present value of the future use of physical property (described in Section 3.6.4), the actuarial present value of future operating expenses (described in Section 3.6.5), the actuarial present value of future refunds (described in Section 3.6.6), and the actuarial present value of the long-term debt (described in Section 3.6.7). The actuary should reflect in the actuarial balance sheet other liabilities from the accounting balance sheet as appropriate, in the actuary’s professional judgment. These liabilities generally include such items as current payables, resident deposits, fees paid in advance, short-term debt obligations, and other items not specifically reflected in the above guidance. The actuary should develop the cohort pricing analysis based on the present value of revenues and expenses associated with a cohort of new residents. The revenues include the advance fees, the actuarial present value of future periodic fees (described in Section 3.6.1), and the actuarial present value of future additional fees and third party payments (described in Section 3.6.2). The expenses include the actuarial present value of the future use of physical property (described in Section 3.6.4), the actuarial present value of future operating expenses (described in Section 3.6.5), and the actuarial present value of future refunds (described in Section 3.6.6). The actuary may consider, subject to disclosure, the use of expense levels consistent with the targeted number of residents when there is expected to be a material change in the population, such as growth resulting from new construction. When developing the actuarial balance sheet or the cohort pricing analysis, the actuary should develop the following present value items. The actuary should estimate the actuarial present value of future periodic fees by projecting the fees payable by the surviving residents of the appropriate closed-group population in each level of care in each future year, and discounting the result back to the valuation date. The estimate of future fees will usually reflect current rates adjusted for projected future fee increases. The actuary should estimate the actuarial present value of future additional fees (such as guest meals and additional meals) and payments to the CCRC from third party payers (such as Medicare, Medicaid, and other insurance), if applicable, by projecting the additional revenue payable by, or on behalf of, the surviving residents of the appropriate closed-group population in each level of care in each future year and discounting the result back to the valuation date. The estimate of these future revenues should usually reflect current experience adjusted for projected future increases to such revenues. The actuary should estimate the actuarial value of physical property for assets currently in service as the present value of the projected remaining annual capital expense charges associated with assets in service as of the valuation date. The actuary should estimate the annual capital expense charge for the use of an asset for each year using its useful lifetime. The projected annual capital expense charge consists of the imputed interest charge for the use of the asset plus the change in asset value from one year to the next. In calculating the capital expense charges, the actuary should use a rate consistent with the cost of capital at the time the asset was originally put into service or the cost of capital in the current economic environment. The actuary should estimate the actuarial present value of the future use of physical property by taking the projected annual capital expense charges for both the current and replacement fixed assets allocated to the surviving residents of the appropriate closed-group population in each future year and discounting the result back to the valuation date. The actuary should use a methodology to estimate the annual capital expense charges that is consistent with the methodology used in Section 3.6.3. The actuary should estimate the actuarial present value of future operating expenses by taking the operating expenses allocated to the surviving residents of the appropriate closed-group population in each future year and discounting the result back to the valuation date. The actuary should exclude from future operating expenses (a) future capital expenditures, which are discussed in Section 3.6.4; and (b) the future long-term debt interest and principal payments, which are discussed in Section 3.6.7. When estimating future operating expenses, the actuary should reflect future cost trends and reflect underlying expense consumption patterns in the allocation. The actuary should allocate expenses across the various levels of care and within each level of care on an appropriate basis such as per person, per unit, or per square foot. The actuary should estimate the actuarial present value of future refunds by estimating the amount of refund due each terminating resident of the appropriate closed-group population in each future year and discounting the amounts back to the valuation date. The actuary should base the estimate of the refund due each terminating resident each future year on the terms of the residency agreement assumed to be applicable to that resident and the CCRC’s actual practice, if any, with regard to payment of refunds. The actuary should estimate the actuarial present value of long-term debt as the discounted value of the projected remaining principal and interest payments as of the valuation date. The present value of long-term debt may be different than the amount on the accounting balance sheet depending on the relationship between the discount rate and the actual or expected interest rate on the debt. The actuary should perform cash flow projections over the projection period using open-group methods and should reflect the projected financial effects of existing residents, new residents replacing existing residents, and non-residents to the extent living unit capacity allows. The actuary should select assumptions in the cash flow projections that are consistent with those used in the development of the actuarial balance sheet and cohort pricing analysis (see Sections 3.4 and 3.5). The actuary should reflect revenues from all known sources (such as advance fees, periodic fees, additional fees, payments from non-residents, reimbursements from Medicare or other third party payer, and investment income). The actuary should reflect expenses from all known sources (such as operating expenses, capital expenditures, debt interest and principal payments, any cost of using an offsite health facility, and refunds of advance fees). The cash flow projection should show the cash and investment balances at the beginning and end of each projection year. The actuary should consider the guidance in ASOP No. 7, Analysis of Life, Health, or Property/Casualty Insurer Cash Flows, when choosing assumptions for cash flow projections. The actuary should consider the guidance below when selecting assumptions for performing actuarial analyses covered by this ASOP. k. operational policies and practices of the CCRC, such as transfer policies. The actuary should consider trend assumptions for rates of mortality, morbidity, and withdrawal that are reasonable, in the actuary’s professional judgment. In selecting trend assumptions, the actuary should consider and review appropriate data. These data may include past trend experience studies, past projections of trends or appropriate industry studies. The actuary should set trend assumptions for periodic fees, advance fees, additional fees, and other revenue items. The actuary should also set trend assumptions for operating expenses, capital expenditures, and other expense items. The actuary may use different trend assumptions, as appropriate, for various categories of revenues and expenses. In setting trend assumptions for periodic fees, the actuary should also take into account practical, competitive, and contractual considerations. The actuary should select assumptions as to future trends in periodic fees that are consistent with the trend assumptions that are used in projecting future expenses. If the actuary uses different trend assumptions for periodic fees and operating expenses, the actuary should disclose this difference in an appropriate actuarial communication. The actuary should select investment rate and discount rate assumptions that are individually reasonable, mutually consistent, and reflective of the long-term nature of the contracts. a. Investment Rate – The actuary should consider the past investment performance, short- and long-term market expectations, and the future investment strategy of the CCRC to estimate investment income for the cash flow projection. b. Discount Rate – The actuary should use a discount rate to estimate actuarial present values that, in the actuary’s professional judgment, is reasonable and appropriate, and is consistent with the investment rate. The actuary should assume an allocation of general revenues and expenses to the various levels of care, and to current and new residents. The actuary should consider whether the sum of all allocated expenses reconciles to the total projected expenses of the CCRC. The actuarial balance sheet, the cohort pricing analysis, and the cash flow projection rely on assumptions predicated on the ongoing financial viability and continuation of the CCRC. This implies that the CCRC will be able to maintain appropriate occupancy levels by attracting new residents to replace existing residents as the latter vacate units. The actuary should consider the ability of the CCRC to attract new residents or any other known, significant circumstances that, in the actuary’s professional judgment, may affect the CCRC’s ability to remain a going concern. The actuary should review the assumptions for reasonableness. The assumptions should be reasonable, in the actuary’s professional judgment, in the aggregate and for each assumption individually, using relevant information available to the actuary. i. any significant margins for uncertainty which have been included in the actuarial assumptions. The actuary should consider both the funds available and the potential future liabilities for residents who do not pay the full scheduled fees. For example, some CCRCs may set aside assets or funds from charitable contributions to assist residents who cannot afford the full scheduled fees, the periodic fee increases, or advance fees. Other CCRCs may include the costs of any assistance in the basic fee structure. When performing professional services with respect to for-profit CCRCs, the actuary should consider the nature and financial implications of the ownership arrangement, including owner’s equity, past and possible future equity distributions, potential income tax liability, and historical and future capital expenditures funded by the owner. The actuary should consider the nature and financial implications of any ownership arrangement, including advance fee payments and refunds, and the value of assets invested in the physical property and the replacement costs of these fixed assets. For example, in some CCRCs, residents may either own a particular unit or a membership in the CCRC. h. any other matter that, in the actuary’s professional judgment, is expected to have a material effect on the CCRC’s current or future financial statements. The actuary should consider restrictions on the CCRC from external sources, such as applicable law, regulation, or other binding authority. Examples include a state’s Medicaid reimbursement policy, regulations restricting the use of health center beds by non-residents, and any relevant lender-imposed restrictions. The actuary should prepare and retain appropriate documentation regarding the methods, assumptions, procedures, and the sources of the data used. The documentation should be in a form such that another actuary qualified in the same practice area could assess the reasonableness of the actuary’s work, and should be sufficient to comply with the disclosure requirements in Section 4.
k. any material changes in assumptions or methods from the most recent prior analysis. The actuarial communication should disclose the actuarial balance sheet, the cohort pricing analysis, and the cash and investment balances at the beginning and end of each projection year, which were prepared to test the three conditions in section 3.2, and state whether or not each condition is met. d. Qualification of Opinion—If the actuary is unable to form the needed opinion regarding whether the CCRC is in satisfactory actuarial balance, or if the opinion is adverse (due to failing one or more of the above conditions), or otherwise qualified, then the statement of actuarial opinion and the actuarial communication should explain why the actuary is unable to form an unqualified favorable opinion. Certain contractual obligations of a CCRC are contingent upon the occurrence, timing, and duration of certain future events. The resident typically pays for such future promised services through a combination of advance and periodic fees, typically before the services are provided. Actuarial methods are used to establish the fee structure and to measure the CCRC’s liabilities for the provision of future promised services. High occupancy, sound pricing, and effective financial management are keys to the successful operation of a CCRC. The ability of a CCRC to attract new residents to fill vacancies will depend on keeping the CCRC competitive as to its physical property, its fee schedule, and the general attractiveness of its whole environment. Current actuarial practices for CCRCs are generally now well established. Prior to the release of the first edition of this ASOP and the release of subsequent educational material by various entities, actuaries used differing analytical approaches. These approaches included differing methods to determine closed and open-group resident projections, projected refunds, physical property valuations, long-term debt, and other items. While historically differences did exist, these differences have now mostly been eliminated and standardized practices have evolved. The physical property, or fixed assets, of a CCRC are a significant asset of the CCRC, and also a significant cost to the residents of the CCRC. In order to provide for equity among generations of residents, it is necessary to allocate an appropriate part of the cost of the use of physical property to current residents as of the valuation date, and to the cohort of new residents. The method described in this appendix for developing and assigning the annual capital expense charge for asset use, determining the asset’s actuarial value, and determining the liability for asset use is one illustrative method designed to provide for equity among generations of residents. (Illustrative formulas for expensing and valuing physical property are presented at the end of this appendix.) Physical property assets may be valued and depreciated using level, decreasing, or increasing depreciation methodologies based on actuarial principles, the nature of the underlying assets and other factors. Capital Expense (Imputed Interest plus Depreciation) Charges—The annual capital expense charge for physical property consists of the imputed interest for the use of the asset, or opportunity cost of using cash resources for purchasing a fixed asset (because it is not an interest-earning investment), plus the change in asset value from one year to the next. a. Each item of physical property is assigned an assumed useful lifetime and an appropriate rate of inflation. While GAAP expected lifetimes might be available, alternative lifetimes may be available from other sources such as engineering studies performed by the client. In the case of land, the expected useful lifetime may be perpetual. b. The annual capital expense charge for the use of an asset is developed for each year using its useful lifetime and is calculated as one of a series of annual amounts. The present value of this series, discounted to the time of acquisition, equals the cost of the asset. This series of annual amounts may be decreasing, level, or increasing. c. In similar fashion, capital expense charges are developed for physical property assumed to be purchased in future years. It is assumed that each asset will be replaced at the end of its useful lifetime with a new asset. The cost of the new asset is assumed to equal the original cost indexed for inflation. The asset is continually replaced at the end of successive useful lifetimes. An approximation of these replacement costs that better reflects the expected magnitude and timing of future capital expenditures may also be used. These approximations reflect a sufficient level of future capital expenditures necessary to maintain the physical property for future use. c. Actuarial present value for future use of physical property consumed by a hypothetical group of prospective residents—reflected as a liability on the cohort pricing analysis. Value of Physical Property for Assets Currently in Service—The actuarial value of each asset is the discounted value (without survivorship) of the remaining annual capital expense charges as of the valuation date. The sum of these values for all such assets in service as of the valuation date is reflected as an asset on the actuarial balance sheet. Value of Future Use of Physical Property for Existing Residents—The actuarial present value of the future use of physical property for existing residents is the discounted value (with survivorship) of the annual capital expense charges for the physical property, and its replacements, allocated to existing residents as of the valuation date. a. The part of each future year’s capital expense charge that relates to the existing residents as of the valuation date is determined by estimating the ratio of the existing resident survivorship group use to total CCRC use. The ratio may be in proportion to population, to number of CCRC occupied beds or units, to square footage, or to some other appropriate measure. For years during fill-up or material change in population, it may be appropriate to substitute a target or ultimate level of use for the actual estimated level of total use. b. The current actuarial liability for the promised future use of a physical asset (and its replacements) with respect to the existing resident closed group is the sum (for all years) of the part of such capital expense charge in each future year related to the existing closed group, as determined in (a), discounted to the valuation date. The actuarial present value of the future use of physical property for the new entrant cohort is the discounted value (with survivorship) of the annual capital expense charges for the physical property, and its replacements, allocated to the new entrant cohort closed group. a. The part of each future year’s capital expense charge that relates to the new entrant cohort is determined by estimating the ratio of the new entrant cohort survivorship group use to total CCRC use. b. The current actuarial liability for the promised future use of a physical asset (and its replacements) with respect to the new entrant cohort is the sum (for all years) of the part of such capital expense charge in each future year related to the new entrant cohort closed group, as determined in (a), discounted to the valuation date. Note: These formulas illustrate allocations on a per-resident basis. Other allocation bases such as units, beds, square footage, etc. may be more appropriate for certain assets. This shows that the annual expense for a physical asset consists of the interest that is forgone (because it is not an interest-earning investment), plus the change in asset value from one year to the next. In the case of land, the annual expense consists of only the interest that is foregone, since there is no assumed change in asset value (lifetime is perpetual). The exposure draft of this revision to ASOP No. 3, Continuing Care Retirement Communities, was issued in December 2006 with a comment deadline of April 30, 2007. Eight comment letters were received, some of which may have been submitted on behalf of multiple commentators, such as by firms or committees. For purposes of this appendix, the term “commentator” may refer to more than one person associated with a particular comment letter. The Task Force to Revise ASOP No. 3 carefully considered all comments received, and the Health Committee and the ASB reviewed (and modified, where appropriate) the proposed changes to the ASOP. Summarized below are the significant issues and questions contained in the comment letters and the responses to each. The term “reviewers” includes the task force, the Health Committee, and the ASB. Unless otherwise noted, the section numbers and titles used below refer to those in the final revised ASOP.